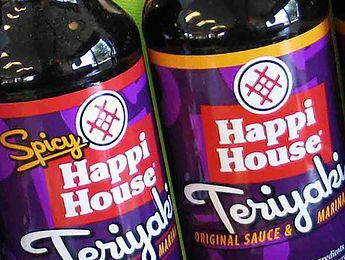 Our famous sauces are available at any Happi House Teriyaki location or can be purchased by the case so you can enjoy the distinctive Happi House flavor anytime! Made from a time-honored family recipe handed down for generations, and the finest natural ingredients, Happi House Teriyaki Sauces are like no other and enhance the flavors of food without over spicing. 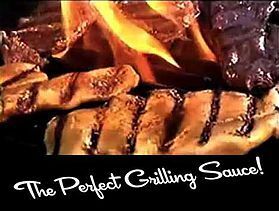 And Happi House Sauces make excellent marinades for meats, seafood, or poultry, and we think it is The Perfect Grilling Sauce! We now only sell our Famous Teriyaki Sauce by the case. The case contains 500/ 13 gram sauce packets. The price and quantity is the same for both spicy and original teriyaki sauce. The price per case is $45 plus shipping and handling Please call 408-929-2113 extension 114 and speak to Stacey. And what could make any “Happi Fanatic” happier than a Happi House Gift Card?! 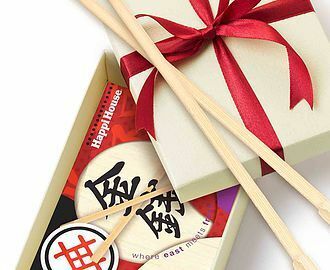 Happi House Teriyaki Gift Cards are available in $10 increments and are valid at any Happi House restaurant. And, we’ll send them anywhere, free-of-charge. OK, if you needed another reason to visit Happi House, here are three of the very tastiest ones. Enjoy a Free Happi House Appetizer, (Fresh Fried Zucchini, Edamame, or Veggie Tempura) with any purchase of $20 or more.